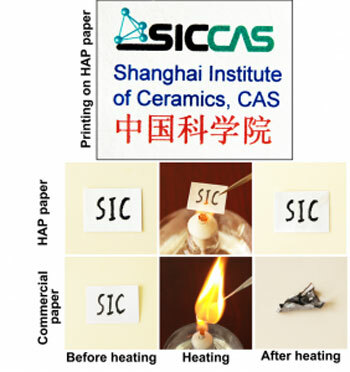 (Nanowerk News) Researchers from the Shanghai institute of Ceramics, Chinese Academy of Sciences have developed a new paper which is resistant to fire and high temperatures (>450°C). They made this new substance from a calcium phosphate compound, hydroxyapatite; the paper can potentially be used for both printing and writing (see paper in Chemistry – A European Journal: "Highly Flexible and Nonflammable Inorganic Hydroxyapatite Paper"). This novel kind of inorganic paper can be useful for important documents – preserving them for prolonged periods of time. Paper is a material essential in our everyday lives; we can use it for many different applications, although the most common ones are writing and printing. Chemically, the main component of the conventional paper is cellulose, a natural polymer extracted from the pulp of wood or grass. Other minor components, such as bleaching agents and additives, are also part of the mix. To have the characteristics necessary for the high-performance printing, paper has to be coated with a very thin layer of inorganic material. Although paper is very important for us, it can cause some problems. One issue is that cellulose may degrade, leading to the formation of acidic compounds such as oxalic, acetic and lactic acid. Moreover, paper made from mechanical pulp contains lignins; these are compounds which, in contact with air and light, can form molecules with a pale yellow color. Another very serious problem is that it is a highly flammable material. All these issues may undermine the use of paper as a long-term storage medium for information. Further to this, the production of huge amounts of paper may have an impact on the environment, as trees and/or grass are used to make it. This effect is becoming more and more noticeable, as our society is producing increasing quantities of paper, with a high level of waste and minimum level of reuse. To try to solve some of these problems, researchers tried to develop alternative and innovative formulations for paper. One possibility is to protect the cellulose with a layer of an appropriate protecting material; in this way, for instance, it is possible to obtain water-proof paper. Alternatively, we can consider paper made of different chemical compounds. Researchers from the Shanghai institute of Ceramics, Chinese Academy of Sciences (Shanghai, China) followed this second approach and developed a new paper made of an inorganic compound, hydroxyapatite (HAp), whose formula is Ca10(PO4)6(OH)2. HAp is a very common material as it is the main component of bones and teeth. As it is very biocompatible, synthetic HAp is normally used to make bone replacement material. This is the first time that HAp is employed for paper fabrication. The HAp paper made with this process has remarkable properties. As already mentioned, it is highly flexible, like the conventional paper; the quality of the printing on it is also comparable to that of the standard cellulose paper. Further to this, it is fire resistant, and also resistant to temperatures as high as 450°C. Moreover, after adding sodium silicate (Na2SiO3) to the HAp matrix, the HAp paper is also very strong; in fact a 450 g weight can be suspended from a small sheet of the paper, without the paper breaking.